Jul et Mad recently launched Les White, a trio of fragrances inspired by 'distant locales and long-ago civilizations'. I've been a fan of this niche brand since Jul et Mad released its debut trio three years ago, so I was naturally curious about these new perfumes that venture beyond France and New York in their inspirations. Néa is meant to evoke the opulence of the "Golden Age in Byzance," with notes of date, davana, pomegranate, palm leaf, black pepper, jasmine, rose, plum, patchouli, cashmeran, vanilla, benzoin, caramel, tonka bean, ambroxan and musk. It was developed for Jul et Mad by perfumer Luca Maffei. Néa starts with the date note, and it's chewy-sweet but not overwhelmingly so. Actually, Néa manages not to be too sweet overall, despite its list of notes. It does remind me of some dessert that I'd gladly eat — an airy honey-cake sprinkled with toasted almonds and a dash of powdered sugar, with a few jasmine petals added to the plate as garnish. But it's a seamless floral-gourmand (fleurmand!) that never turns trashy, and it would probably entice fans of A Lab on Fire What We Do In Paris is Secret or Parfums de Nicolai Kiss Me Tender. Nin-Shar, the second scent in the trio, was inspired by the Hanging Gardens of Babylon and by Nin-Shar, the Sumerian goddess of vegetation. Nin-Shar includes notes of bergamot, davana, rose, jasmine, patchouli, oud, benzoin, vanilla, cedar, sandalwood and incense and was created by perfumer Sidonie Lancesseur. It's definitely an oriental rose; I approve of this concept, of course! It's not quite as complex and surprising as Neela Vermeire Creations Mohur, but it's still worth a try if you enjoy Mohur (or Byredo Rose Noir, Serge Lutens La Fille de Berlin, et al.). It opens strong, with a booze-y, rum-like note (complete with a hint of woody cask!) and a camphorous edge of oud, but it gradually turns more wine-like and even jammy. Nin-Shar needs a while to quiet down before going out in public, and then it (she?) is an elegant and well-behaved darkly fruity rose. Lastly, Garuda is named for the bird-like "protective divinity" of Hinduism and Buddhism and the temple reliefs of Angkor Wat. This fragrance was also composed by Luca Maffei, and it includes notes of bergamot, orange, cumin, pink pepper, oud, saffron, rum, patchouli, timbersilk, vetiver, cedar, cashmeran, amber, vanilla and musk. Garuda is oud-heavy, and I never know what to say about pungent ouds; I'm not an expert in the genre. ("Just say that it's a pungent oud," advises Robin.) In my limited oud experience, this one seems smoky and aromatic, and yet it also has a powdery side from the amber and musk. For a minute it reminded me of Molinard Habanita, but I may be way off with that comparison. It's not "me," but perhaps one of you who has deeper oud experience has tried it and will be able to weigh in. I almost wish Jul et Mad had waited until autumn to release this collection; these fragrances are all a bit rich for hot-weather wear. Still, they're evocative, and since I don't have any summer travel plans, I can apply them sparingly, stick to air-conditioned interiors, and let them take me on olfactory voyages. Well, maybe not Garuda so much — because, oud. But the other two, definitely yes. 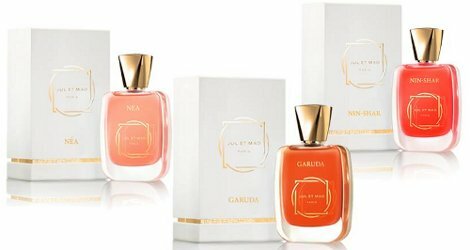 Jul et Mad Les White Néa, Nin-Shar and Garuda are each available as 50 ml (plus 7 ml) Extrait in a "Love Basics” bottle (golden cap and front decoration, in a white and gold carton) for $190 (€165) and a luxury coffret (gold-plated flacon and gold "nomad" spray with crystals, in a white lacquer case) for $530 (€485). The Jul et Mad collection is available in the US at Indigo Perfumery or MiN New York, or in Germany at First in Fragrance. I wish it were easier to find samples. I haven’t even tried Stilettos on Lex yet. nozknoz, I think Indigo and Min still do samples. I bought the other Jul et Mad stuff from Indigo a while back. A couple of years ago, samples of this line *were* difficult to track down — and then Aedes did have them — but Holly is right, Indigo is probably a good bet these days! I wonder why they have such limited distribution, but admittedly I have no head for business. These do sound more suited for cooler weather, so I will just imagine them to be like fashion that is always shown one season ahead. And yes, the ac will help. I wonder why, too! They’re certainly just as nice, and no more expensive, than many other niche lines out there. Maybe J&M just prefer to remain smaller? I have no business sense, either. You know Jessica, I see oud in a composition and I too am a bit hesitant: Will it be dominated by camphorous properties and totally smell medicinal or will it blend well with other notes ? Like in the case of CdG’s Wonderwood or Amouage Epic. Oud can really work against me,like amber and vanilla dominance. I don’t mind an accent of oud here or there, as you can tell — but a big tarry-oily-burnt oud makes me cringe. Fortunately, that’s not the case here! Nea and Nin-Shar – YES! That would be my short personal-tastes review, hah! Hope you’ll have a chance to try them.